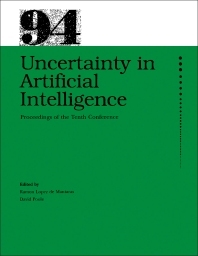 Uncertainty in Artificial Intelligence: Proceedings of the Tenth Conference (1994) covers the papers accepted for presentation at the Tenth Annual Conference on Uncertainty in Artificial Intelligence, held in Seattle, Washington on July 29-31, 1994. The book focuses on the processes, methodologies, and approaches involved in artificial intelligence, including approximations, computational methods, Bayesian networks, and probabilistic inference. The selection first offers information on ending-based strategies for part-of-speech tagging; an evaluation of an algorithm for inductive learning of Bayesian belief networks using simulated data sets; and probabilistic constraint satisfaction with non-Gaussian noise. The text then examines Laplace's method approximations for probabilistic inference in belief networks with continuous variables; computational methods, bounds, and applications of counterfactual probabilities; and approximation algorithms for the loop cutset problem. The book takes a look at learning in multi-level stochastic games with delayed information; properties of Bayesian belief network learning algorithms; and the relation between kappa calculus and probabilistic reasoning. The manuscript also elaborates on intercausal independence and heterogeneous factorization; evidential reasoning with conditional belief functions; and state-space abstraction for anytime evaluation of probabilistic networks. The selection is a valuable reference for researches interested in artificial intelligence.